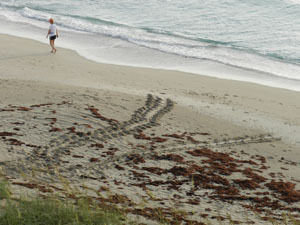 Hutchinson island is witness to many newborn babies including endangered sea turtles. If you plan to visit Hutchinson Island during the summer months, you may have an opportunity to see something very few ever get to see, nature at it's very best; sea turtles nesting. Here you'll learn about the sea turtles that come up to nest on Hutchinson Island, find information how to view nesting turtles and emerging baby turtles legally and responsibly, as well as tips and suggestions to encourage nesting and about the Florida laws protecting the sea turtles and nests. Five species of sea turtles are found swimming in Florida's waters and three of the five, Loggerhead, Green and Leatherback, nest right here on Hutchinson Island beaches. 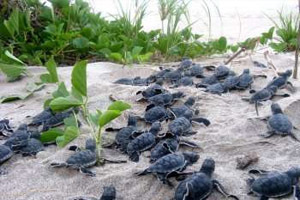 Annually, sea turtles annually make between 40,000 and 84,000 nests along the Florida coast. 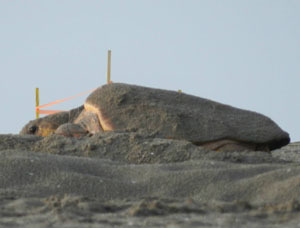 The nests are monitored daily during the 109-day sea turtle nesting season (March - October). Researchers recorded nests and nesting attempts by species, nest location, and date. During nesting season the nests are marked with wooden stakes and/or orange tape with the pertinent information. 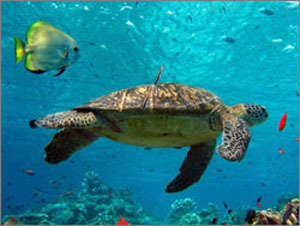 Loggerhead Turtles, the most common sea turtle in Florida weighs and average of 275 with a shell of length of 3 feet. 90 percent of all loggerhead nesting occurs in Florida. The majority of this nesting takes place on the east coast of Florida. Loggerheads typically nest in Florida from April through September. Each nest contains on average 100–126 eggs that incubate about 60 days. Green Turtles weigh an average of 350 lbs and a shell of 3.3 feet. Green turtles nest on Florida’s beaches each year from June through late September. They can lay as many as 10 clutches, with about 12 days between each nesting. The average number of eggs in a clutch is about 115. Leatherback Turtles weigh anywhere from 500 to 1500 lbs and are about 6 feet in length. 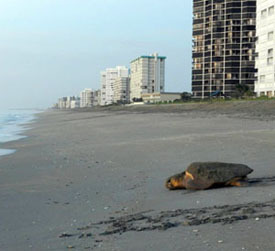 Leatherback nesting in Florida occurs from April through July. They lay about 80 fertilized eggs and then covers them with a layer of about 30 unfertilized eggs. protecting the fertilized eggs from predators. Hawksbill Turtles grow to about 45 inches in shell length and 150 pounds in weight. Mating occurs every two to three years and normally takes place in shallow waters close to the shore. The hatchlings will emerge about 60 days from the date the mother lays her eggs. Kemp's Ridley is the most endangered sea turtle and the only sea turtle that doesn't nest in this area. They are the only species of sea turtle known to lay their eggs during the day, laying around 110 eggs per nesting. Hawksbill Turtles, a critically endangered sea turtle, weighs from 100 to 200 lbs and only has a 30 inch shell length. While the turtle lives a part of its life in the open ocean, it is most often encountered in shallow lagoons and coral reefs where it feeds on its chosen prey, sea sponges. 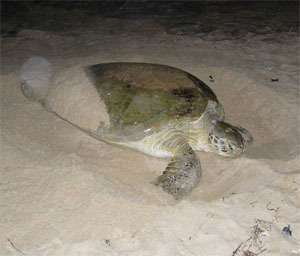 Females drag their heavy bodies high onto the beach during the night, clear out an area and dig a nesting hole using their rear flippers laying a clutch of around 140 eggs. If you journey to the beaches at night, please familiarize yourself with the Sea Turtles laws in here Florida. Florida takes it's Sea Turtle Conservation very serious and certainly doesn't want anyone to get in trouble while they're here visiting. 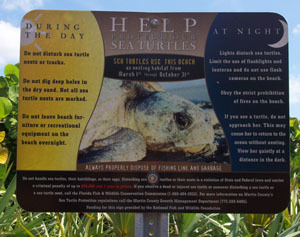 All public beaches and many private beaches have signs to education people on the Sea Turtle dos and don'ts. Keep in mind, most of these sea turtles have had an exhausting, thousands of miles journey to Hutchinson Island to their lay their eggs. Give them plenty of space and don't approach them just to get a closer look or to get a picture. The opportunity for pictures will come when they are done laying and they are on their way back to the ocean. It generally takes about an 1 hour to 1 1/2 hours to nest. If you approach them while they are on their way up the beach or before they have started laying, they will be scared off and they will turn around without laying their eggs. Most sea turtle hatchlings emerge at night but on occasion, they will emerge in broad daylight. As tempting as it may be, DO NOT DISTURB the baby sea turtle on it's way out to sea. Do not go back to the nest and dig it up to see if any more are in the nest (yes I have witnessed people doing this!). This is against the law! Sea turtles have been doing this for millions of years before man even walked the earth and our interference will only be just that...an interference. Give these mamas plenty of space and you'll be rewarded with an experience of a lifetime! 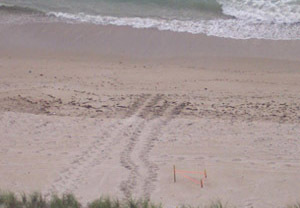 The people of Hutchinson Island do their best to encourage the nesting sea turtles by keeping their lights off at night, including not using flashlights on the beaches at night and and picking up the debris that floats ashore. Nesting sea turtles look for dark, quiet beaches to lay their eggs. Lights from buildings along the beach distract and confuse the females, as well as the hatchlings. Thousands of sea turtles die each year from eating and becoming entangled in plastic bags and balloons floating in the water as sea turtles mistake them for one of their main food sources, jellyfish. Please pick up your trash on the beach. Do not dig on the beach and fill in any holes you may see. Leave only foot prints.